This article was compiled from a number of different sources. Chile is one of those countries that most people may have heard of, but many don’t really know where it is. 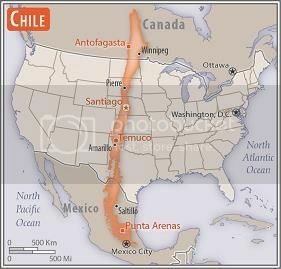 Chile (pronounced CHEE’-lay, not “chilly”) is on the west coast of the South American continent and occupies approximately half of the entire west coast of the continent—approximately 6,435 km or 3,998 miles. At its widest point, however, the country extends only about 300 km (186 miles) east-to-west, with the entire western limit being the Pacific Ocean and the eastern border running along the crest of the Andes Mountains, separating Chile from Argentina and Bolivia to the east. Overall, with an area of 291,930 square miles (756,096 square kilometers) Chile is approximately nine percent larger than the state of Texas (268,581 square miles, 696,241 square kilometers), and had an estimated population of 18 million people in 2015 (compared with a population of 27,469,114 for Texas in 2015). Although private ownership of firearms is legal, owing to the great number of legal restrictions that exist in Chile governing the acquisition, ownership and use of firearms, there are few citizens that have them. According to data from the Dirección General de Movilización Nacional (DGMN), the supporting agency of the army responsible for regulating the use of weapons and explosives, as of March of 2013 there were 765.551 firearms legally registered in the country. Of that total, 95.69% were in the hands of natural persons, corresponding to 732,534 weapons. The remaining 4.31%, 33,017 weapons, were registered to corporate entities. Editor’s note: There is some confusion in the listing above because, in the original Spanish, item number 4 (“rifle”) and item number 6 (“fusil”) both translate to “rifle” in English. The editor cannot find any explanation of why the Chilean authorities maintain separate counts on two types of “rifles.” Similarly, it is unclear what—if any—distinction exists between the Spanish “pistola” and “pistolete,” both of which translate to “pistol” in English. The best suggestion is that a "pistolete" is a pocket pistol, but where the Chilean authorities draw the line is unknown. Perhaps "pistolete" refers to firearms such as derringers? Regarding the uses that were declared by the citizens when they registered their firearms, the great majority indicated that they were for personal defense and/or for defense of property: 398,798; in second place was hunting, with 270,213 registrations; and a very distant third place went to sports use and other. A curious datum in the registration of firearms in Chile according to gender is that the men prefer the use of shotguns, due to the practice of hunting; while the women prefer the use of revolvers over other types of firearms, given that their primary motivation for acquiring a weapon is personal defense. According to figures from the DGMN, in the five year period from 2006-2011 registrations declined by more than 60%. This it is one of the figures cited in support of the purported success obtained by the two last governments regarding the decrease of weapons in private ownership in Chile. Campaigns to surrender firearms to the police and to destroy them have been carried out in Chile since 1990. Although there had been a general trend toward a progressive increase in the elimination of firearms, from 2009 to today we have seen a drop in the trend. In 2009 the authorities destroyed 7,281 weapons, while in 2012 they destroyed only 5,554. On the other hand, no firearms are manufactured in Chile itself. Therefore, all firearms are imported, mainly by institutions: the Armed Forces, the Carabineros of Chile, and the PDI (the Policía de Investigaciones de Chile—Chile’s equivalent of the FBI in the United States), and lastly by armerías, which are the businesses that supply guns to the public (in other words, “armorers,” or “gun shops”). The average number of firearms imported per year into Chile is approximately 60 thousand units, according to customs data. The great dilemma in Chilean public opinion regarding the ownership and the use of firearms on the part of the citizens relates to the efforts of the government to reduce the number of firearms in the hands of criminals. The great government offensive to combat the increase of armed criminals began in 2005, with the promulgation of the new Law of Weapons. Though the revised law is more restrictive, it permitted the re-registration of firearms in the possession of people who, for whatever reasons, had them in an irregular way. One of the major changes that were made to the law called for the incorporation of a psychophysical examination. This would be performed by a doctor who would certify that "the person possesses a psychological and physical ability compatible with the registration and ownership of firearms." Another important change is that the person not only must show that he has not been convicted of a crime or misdemeanor, also now he must show that he has not had any oral judgment dictated against him. For this purpose, the magistrates of warrants must submit monthly to the DGMN a tabulation of persons regarding whom a resolution of that type was dictated. In addition, those interested in registering firearms may not have been arrested for domestic violence. The result of these restrictions was seen quickly. In the year following their promulgation, 8,796 firearms were registered and, since then, the number has been declining. According to official data, in the last seven years voluntary surrender and confiscation of firearms has increased by more than 30 percent. However, a significant increase has also been seen in the number of illegal firearms possessed by criminals. On the one hand, the authorities claim that the armerías are responsible for selling firearms to people who then transfer them to the criminals. The gun shops defend themselves by arguing that the penalties for crimes are very low. Ennio Mangiola, a director of the association of gun dealers, indicates that, "The problem of armed criminals has not been resolved because the focus is on the wrong problem. This can be solved with something very simple: more firmness in the effective sentencing of people who are found with illegal firearms in their possession. That way, yes, we would be restricting the use of firearms by criminals. It should not be that the law does not distinguish between a criminal who is caught carrying a firearm with the serial number erased, and a person with his permit current who is transporting his guns to the shooting range but he left the permit at his house. The law, in these two cases, applies the same penalty to both. The penalties for the criminals for carrying illegal firearms are very low!" Mangiola agrees that the "illegal market" should be attacked, and he mentions also "the gunsmiths who make counterfeit firearms" or who modify firearms so that their origin cannot be detected: "The efforts should be put there, in controlling more and better that market, rather than controlling legitimate commerce that complies with all the laws." Cristián Gamboa, founder of the Agrupación Nacional por la Tenencia Responsable de Armas (National Association for the Responsible Ownership of Firearms), agrees with Mangiola: "The law that we have is okay, now what is important is that they be dedicated to applying it. One must prevent that people lose firearms, or pass them on to a friend, etc. If they apply the law that there is, the informal market is going to diminish notably." Editor's note: The above should sound familiar to readers in the United States. It is a universal complaint among pro-Second Amendment activists that new gun control laws don't do anything about restricting criminals from obtaining firearms, the new laws invariably penalize and restrict only law-abiding citizens. And the complaint that criminals convicted of firearms offenses don't receive strict enough sentences is universal. We encountered numerous videos on Youtube of IPSC and three-gun competitions in Chile. Not only firearms but also gun parts are tightly controlled and regulated in Chile. Looking at photos and videos of competitions in Chile it can be seen that a number of competitors have Open-class, or "race," guns. That's not easy to achieve in Chile, and the owners of those guns go through some complicated juego de manos (sleight-of-hand) to build those guns. The editor can attest that both guns and ammunition are expensive in Chile compared to the United States so, when you see these guys blasting away, you know they really love their guns and their shooting. 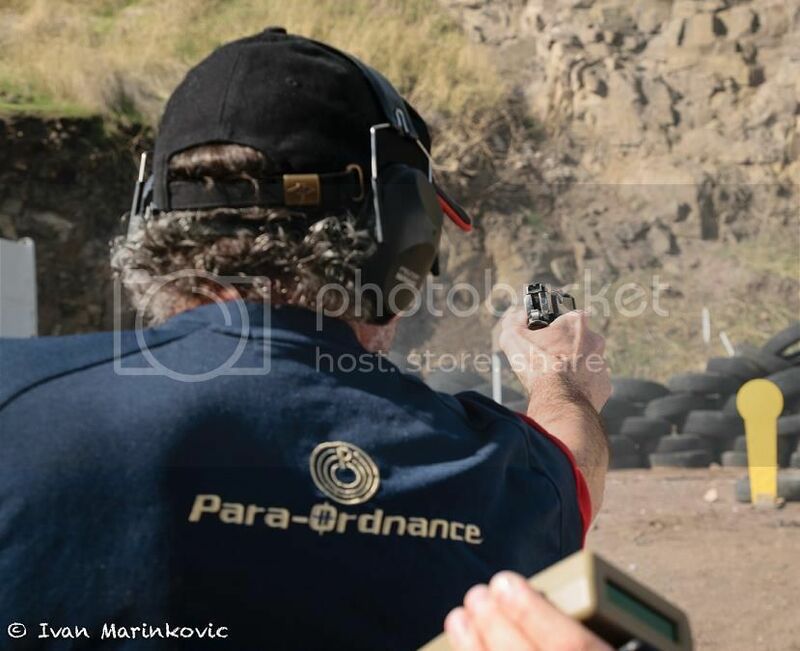 The video below was taken at an IPSC competition at the Club Tralkan, which is located on the outskirts of metropolitan Santiago. The government agency responsible for regulating the use, registration, ownership and transportation of firearms in Chile is the Dirección General de Movilización Nacional (General Directorate of National Mobilization, or DGMN), which is a department of the Army of Chile. Applicants must submit a written examination to demonstrate that they have knowledge regarding storage, maintenance and management of the weapons that they intend to register, in addition to possessing a psychological and physical condition deemed suitable for the ownership and use of firearms. The psychological certification must be from a psychiatrist, not a psychologist. Obviously, the registration process is therefore an activity that has to be undertaken in person by the applicant. Therefore, firearms cannot be recorded remotely (by mail or e-mail or on-line), or through third parties. The applicant must be of legal age. In the case of under-age competitors, exceptions are made if properly authorized. Must not have been convicted of a felony or criminal misdemeanor, or domestic violence, to be documented by a criminal background check report. Certificate of residence from the Carabiñeros of Chile. Certificate by a psychiatrist, that attests that the applicant has the mental health necessary to be responsible for a firearm. To verify the criminal backgrounds of citizens interested in registering firearms, the courts of guarantee are required to send up-dated information to the DGMN on a regular basis. The bearer or holder of a registered firearm must attest, each five years beginning from the date of the registration, that he complies with the requirements contemplated in the law. The registration is for the person, not for the number of firearms that he has registered. If the bearer or holder of a registered firearm loses the qualifying capabilities prescribed by the law, or if he is convicted of a crime or charged with domestic violence, he automatically loses his legal permission for the possession and use of firearms. The registration only authorizes its bearer or holder to maintain the firearm in the place declared, either his residence, his place of employment, or the place that he intends to protect. Prohibited firearms are all automatic or semi- automatic long arms, such as submachine guns, machine guns, rifles, and carbines—that is, arms that are primarily designed for war, and short firearms of automatic operation. In addition, no individual is allowed to possess or to have firearms of personal manufacture; firearms modified from their original condition, without authorization of the General Direction of National Mobilization; fantasy firearms; or firearms that have been cut down or with the serial numbers removed. In Chile the law authorizes the person to have a firearm and to keep it in a fixed place. Only in some special cases, in which the person has been shown to be in danger, can a person carry a firearm on his person. In the event a firearm is lost or stolen, the Carabiñeros or the PDI must be notified within a period of not more than five days after the incident. In addition, the nearest Supervisory Authority must also be informed for the respective record in the National Firearms Registry. Overall, private ownership of firearms, and especially handguns, is possible in Chile but the government tends to discourage it without outright banning it. The legal process for purchasing and registering firearms is very bureaucratic, and it is highly probable that many Chileans own and keep firearms without bothering to go through the legal registration process. That said, personal carry of firearms on the streets for self defense is almost unknown in Chile. Editor’s note: As in all countries where private ownership of guns is prohibited or severely restricted by the laws, the effect is only to disarm the honest members of the populace. The editor’s daughter lives in Santiago, Chile. Two years ago she was held up—at gunpoint, in broad daylight—in a subway station on her way home from classes at her university.